- Finished size -15x44mm PEFC Scandinavian Redwood. 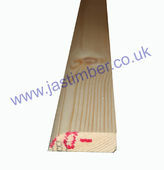 Ideal to use as an Architrave or Backmould for trimming round door frames, window frames and other openings. - Latest 2 inch R-1-Edge Stock has Scandinavian Mill mark : *SCA* - Previous marks include: SCA - STORA - ENSO - etc. - JAS Timber cannot be held responsible for any variations in machined 2" Architrave sizes, pattern, construction, grading, moisture-content, treatment, certi­fica­tion, knots, colour or grain. - We cannot exchange any Timber Mould once work has commenced. Larger orders of 2" Architraves, and Direct Deliveries are supplied as a Special Order. - We cannot exchange any Timber Product once work has commenced. Prepared Skirting and Architrave orders at variance with our normal stockholding, and all Direct Deliveries are supplied as a Special Order. Payment - We can take Debit Card, BACS, Cash, Cheque or Credit Card payment online for Timber 2 inch Architrave. The chargeable carriage weight for Machined 50mm Architrave is 0.45Kg per metre, to include the minimum of packaging, our careful packing and the XDP® Standard Zone-A Carriage Charge; To order online - Click add to basket; To see your ongoing Order Total or to amend, click the icon at the Top-RHS of the page in the Green Navigation-bar. Haulier Delivery by pallet can be arranged for larger quantities of Softwood 2" Arc Moulding. E. & O.E. see T&C - We do try to keep prices and specifi­cations of 2" Arc correct, but mistakes can be made! Please let us us know if you do spot any errors - thanks.